Abdollah Nouri received the most votes in the Iranian of the year survey. Nearly 21 percent of the readers of The Iranian who took part in the survey chose the former interior minister as the most significant Iranian personality of the past year. See comments below from readers. For news and features on Nouri, click here. President Khatami and the student movement received the second and third highest votes. In the next few days ALL others who received votes will be introduced here, along with comments from readers. * Nation's message * Paved way for Iran-U.S. There comes a time in every influential person's life, a "defining moment," when they can choose either of two entirely different paths, and by choosing to be on the side of Right and Truth, they ensure for eternity their name's glory and honor. I believe Mr. Nouri has done so in his now world-famous clerical court defense, the entire transcript of which is now a bestseller, called "Shokaraan-e eslaah" ("A Reformer's Hemlock"). He has started a movement of tectonic proportions in Iran, Islam, and Shi'ism. masaa'eli ro dar yek daadgaah-e alani matrah kard keh harf-e del-e bishtar-e mardom bood. defaa'yiaat-e nouri dar daadgaah dar tarikh-e Iran bi-nazir bood. hichkas ta haalaa natooneste bood intori dar daadgaahe alani az yek nezaam enteghaad koneh. tanhaa chizi keh baraaye abdollah-e nouri matrah nabood raftan beh zendaan bood. I would nominate Abdoulah Nouri as the Iranian of the year. 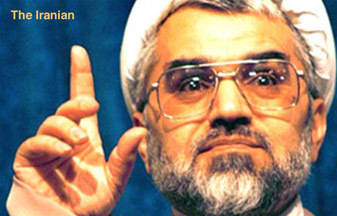 His defense in the court was the most brilliant manifestation of the force of the reformers in Iran. He initiated a trend that followed after his trial, that is, to be able to question the past, the leader, the faith, and the nation's foreign and domestic policies at large. Nouri is the Galileo of Iran. He was taken to the inquisition court, but said it all instead of "repenting" and "confessing" to his "sins". * Paved way for Iran-U.S. I think the Iranian of the year should be Abdollah Nouri. I believe he had the courage to put the Iranian government on trial on national TV. He discussed topics that were considered taboo for many years. He most likely paved the way for the improvement of U.S.-Iran relations. I think the Iranian of the year is Abdollah Nouri, because he dared to address certain issues, and expressed his sincere beliefs. Previously, no one dared to speak about these sensitive subjects in the Islamic Republic. He was jailed for his beliefs, yet he still stood by them, not backing down. Nouri: Because, his background as a respected religious leader known among the hierarchy, gave special vigor and credence to his courageous defense in a kangaroo court set up by the ruling hardliners. Questioning the authority and the very position of The Supreme Leader was done so skillfully that to my knowledge no one before has done it with his clarity. I think Abdollah Nouri should be recognized as the Iranian of the year. His remarks in the court which was very revealing, and his approach and understanding of Islam as a tenet reminds me and many others as Martin Luther. Other people who are among your list are certainly important as well, namely: Khatami, Elahian, Nabavi, Jalaii-pour and Akbar Ganji. The most significant Iranian figure of the past year is Abdollah Nouri. He practically put the regime on trial and educated Iranian people on what had happened in the country and caused the students movement. No one has ever defended democracy and freedom so openly and blatantly. His name will be inscribed in Iran's history for ever. He has publicly challenged the legitimacy of "Velayate Fagih." He broke the glass of imaginary things, treated as holy matters covered by religion. He provided a good base for going away far from that area, which was understood as "permissible". He found a revision view concerning all "rules", accepted before. He is a real modernist. I Choose Mr. Abdollah Nouri because of his brave appearance and defense in court. Abdollah Nouri has expressed that his own faction was wrong 10-20 years back and now they have realized that people are not sheep. I hope he remains true to what he has said in court. Nouri: because in the court he announced the Iranian nation's message, something that nobody has dared to utter publicly. Also he preferred to go to jail instead of dealing with conservatives. Nouri: For insisting for the rights of freedom and defending himself against the hardline judge.